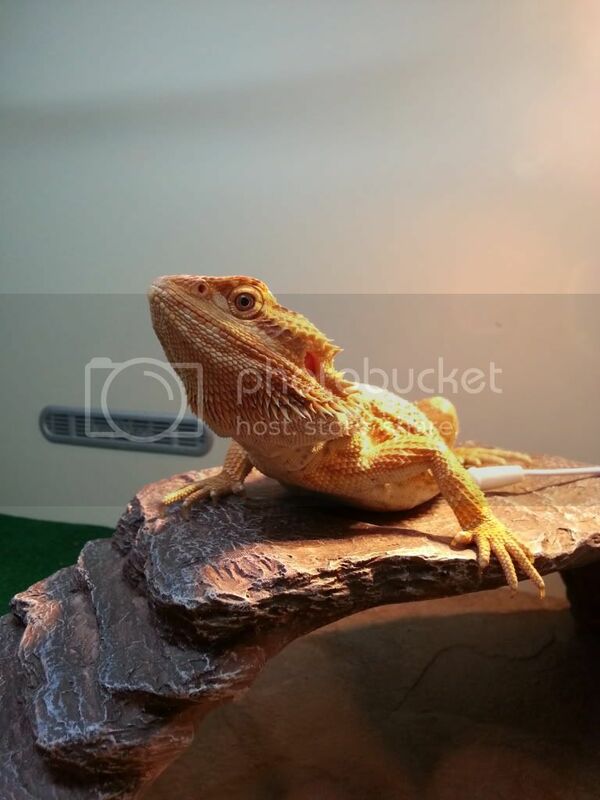 You all know how this goes......Your walking, browsing a petshop, you aim for the reptile section, and there it is, A beardie catches your eye. Be it its colours, its manner, or your just a softie . Of course the wife or husband is with you. Now its time to talk them it to how dam cool that dragon is......"We must take it home!" you plee. Yea yea, I know. But he's already loved. We couldn't resist to be honest. We went to a pet shop we have never been to. And he literally came running up to the glass. The kind girl in the shop let me handle him. He was no problems, so very content. We had to have him. I have a spare viv, UV, bulbs, Rep Carpet etc. So why not. Only thing I aint got, but it will arrive Tuesday, is another dimmer stat. But I put in a 25w Exo Sun-Glow bulb, seems to be hold at about 37/38c in basking area. That will do until I get the stat and can put slightly higher watt bulb in knowing the temp will be regulated. He will be a year old in January, he poo'ed last-night. Today ate some greens, and then 10 large (ish) Dubia. So I'm well pleased with that. Oh, then he poo'ed again today. So all in all, seems happy. But we shall leave him to it for a week or so, minimum contact but for feeding and cleaning. He is aslo yet to be named . Will keep you updated on that one. 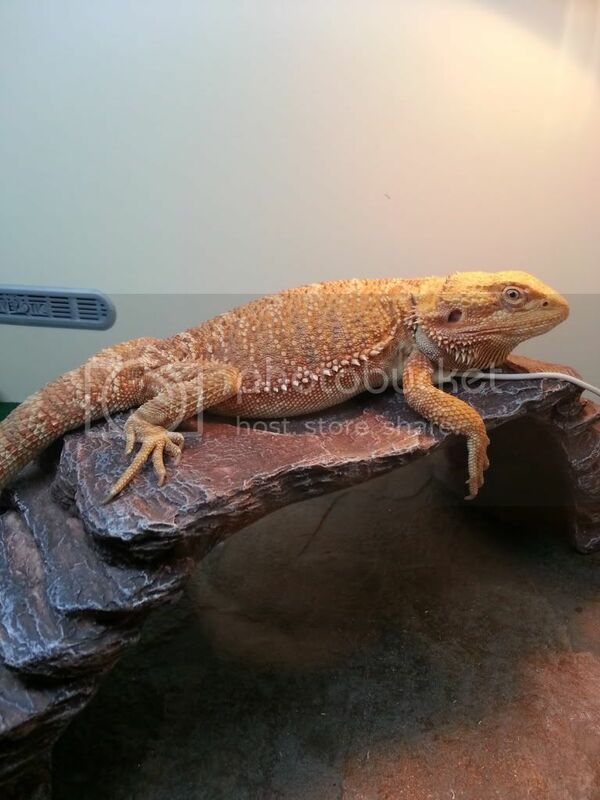 That's one health looking dragon - I'd have guessed him as being nearer 18 months from the photo. Great buy there ! We are all we happy with him. He a lively one, and a jumper we've noticed. I put my hand in to feed him, he jumps on it, its pretty funny. He eating well, had 9 Dubia yesterday, and about the same the day we got him (going with every other day feeding). He's not touched greens, but he's eating and has poo'ed a healthy looking poo everyday so far. As for his age, they said he hatched in January, and I guess I'll take their word for it. They did have all his info on file. But he is around 15". And I'm no good at judging age. Had a change around the day after we got him. Used another hammock I had spare, and his basking step/ledge thing now moved a little. He's been very good. Didn't eat for a couple of days after we got him home. To be expected really. But man, he loves his Dubia. I'm so glad too. Although not touching his veg . As I do breed them, and have a very healthy stock. But with Bane not really eating them for past 3/4 months, and now also In brumation. And Myles not eating anything (although he's been eating 2/3 calci worms a day, so Its a start). But with that, my stock was plentiful. So I'm glad he can pick up the slack. 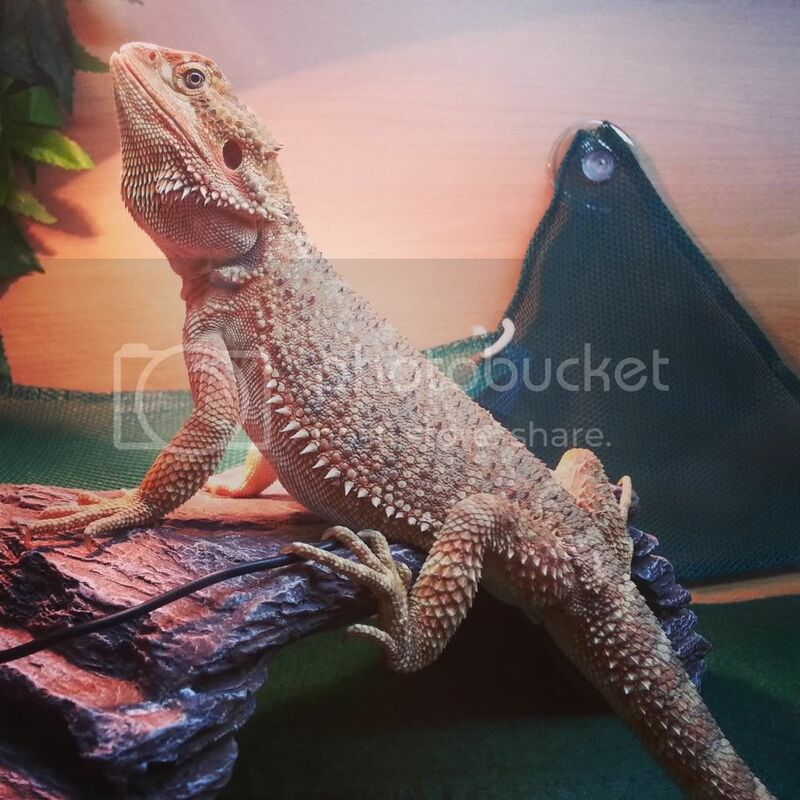 Here he is today, basking so so proud after a fill of Dubia. You should give him the full name as he appears to have a nice rose overtone to his colouration. He does very much so doesn't he. Axl Rose it is from now on.